Captain Peter Singlehurst is from the Media Operations Group(V) and is currently serving as the Media and Ops Info Officer, with 17 Port and Maritime Group in Cyprus. 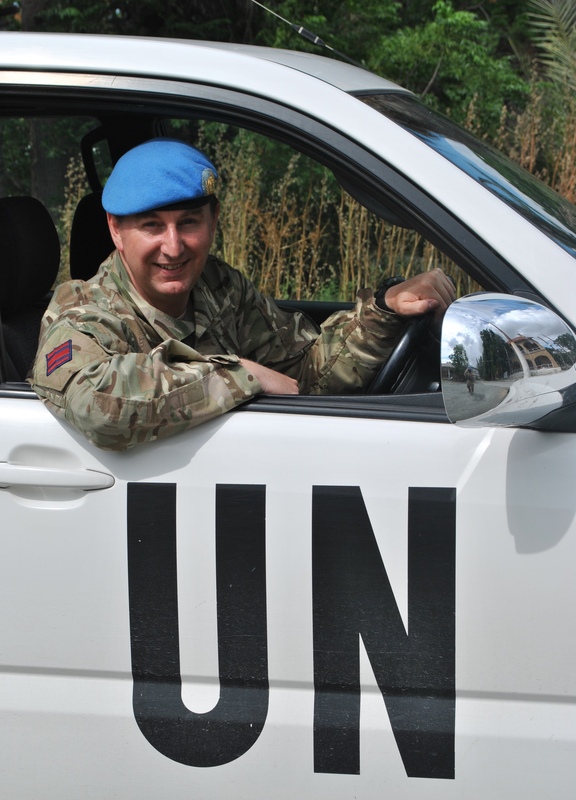 In this blog I am going to look behind the scenes at where we in Sector 2 actually live during our tour here in Cyprus with the UN. Our camp is made up of the former Ledra Palace Hotel, a small part of the former colonial period Wolsey Barracks and some other buildings. All of this is in the UN Buffer Zone, the area controlled by the UN that separates the 1974 cease fire lines of the Republic of Cyprus National Guard and the Turkish Forces. The Ledra Palace Hotel was once really quite famous, and was known as the most glamorous and luxurious hotel in Nicosia. Originally built in 1949, the hotel in its heyday had 163 bedrooms, together with a conference room, library, card room and ballroom with orchestra. There were two restaurants, two bars, a café and several small shops. In the garden there was a swimming pool, paddling pool, children’s playground and tennis courts. In 1974 following the military action the Ledra Palace Hotel found itself isolated in the newly established UN Buffer Zone, between the Turkish and Greek Cypriot cease fire lines and during the fighting the hotel suffered superficial damage that is still visible today. As a result the hotel became a base for UN peacekeeping troops, first the Canadian contingent and now, following their withdrawal, the British. As we walk around the ground floor we find the various messes, the old ballroom has been divided and is now the main cookhouse and our gym. Where once the notice boards would have told of holiday excursions there are now military notices and everywhere are signs of the military use of the former hotel for the last almost 40 years. As we climb the main staircase around us there is constant activity, this after all is the the centre of a military operation that goes on 24 hours a day seven days week. On each floor is both living accommodation and the Troop offices from which the Buffer Zone patrols are organised. Walking down the corridors the way is illuminated by harsh strip lights. An industrial electrical system has been added with trunking attached to the walls. There is a constant hum from the electricity. We walk past one of the rooms that has been set aside for washing machines and smell the sweet smell of washing powder. Looking up the hotel’s old plumbing has been replaced with an industrial system. The pipes are exposed the same as the trunking, this is a building that has lost its refinement and has become utilitarian. As we continue to make our way to the roof we can hear and see Cypriot builders gradually refurbishing rooms that have fallen into disuse. As we arrive on the roof we emerge into the bright sun, and the heat is reflected back off the flat roof, under a lazily flapping UN flag, we can look out over the city. 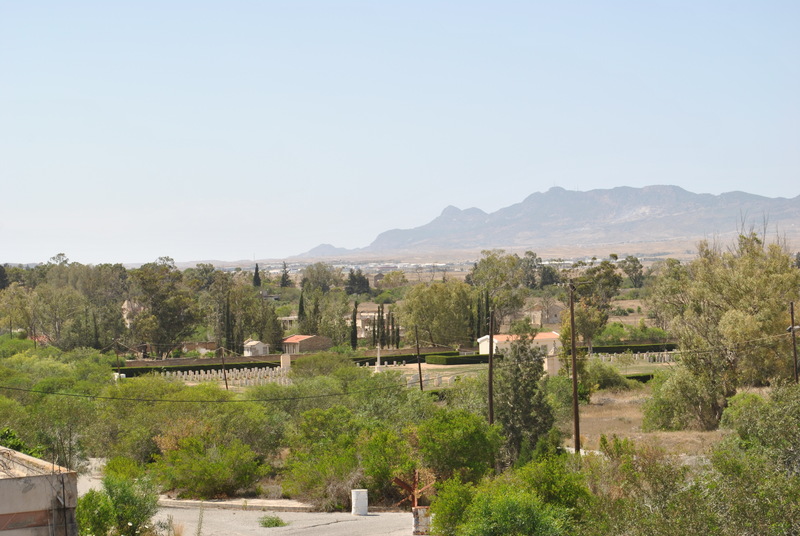 To the north we see the Turkish cease fire line running near the old tennis courts and in the distance the Kyrenia Mountains, with the massive iconic flag of the Turkish north on the side of the mountain. To the west we look into the buffer zone and agricultural land with the Troodos Mountains beyond. To the east is the old bastion walls of Nicosia and the roof tops of the old town with the minarets of the Selimiye Mosque prominent. South we see the modern buildings of central Nicosia that reminds us we are in Europe’s last divided city. Returning to the ground floor and the outside we walk across the car park on one side are war damaged buildings; on the other side is the Greek Ambassador’s residence. As we walk across depending on the time of day the cicadas are chirping or the bells of the Greek Cypriot churches are ringing or the call to prayer from the Turkish Cypriot mosques rings out. At the main entrance we can see Cypriots and tourists making their way to the Buffer Zone crossing beside the Ledra Palace Hotel, but if we look behind us there is the Buffer Zone, overgrown and quite, frozen in time since 1974. Captain Peter Singlehurst is from the Media Operations Group(V) and is currently serving as the Media and an Ops Info Officer, with 17 Port and Maritime Group in Cyprus. 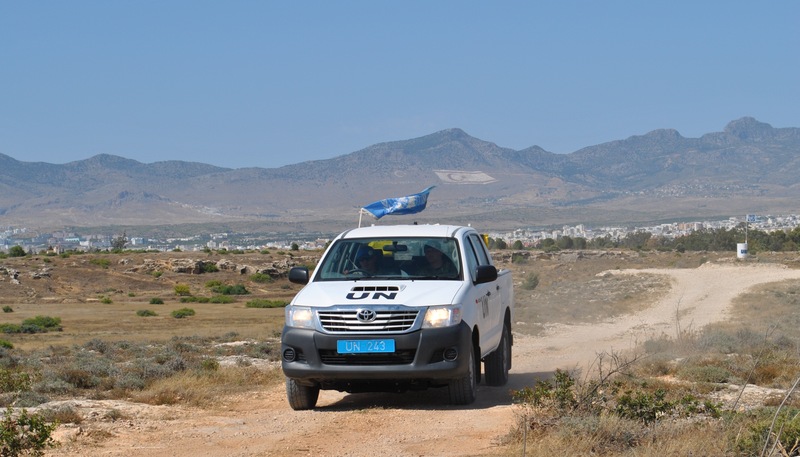 The day-to-day work of Sector 2 is patrolling our part of the Buffer Zone here in Cyprus, as I have mentioned before this is carried out in four ways, namely in vehicles, on bikes, on foot and in the air. This blog will describe a recent vehicle patrol I accompanied in the west of our area. Normally patrols consist of two soldiers, either two Privates or a Lance Corporal and a Private. For this patrol they were joined by me and some army media personnel from the Media Operations Group, who were in Cyprus to gather material to help tell our story. For this blog however I will concentrate of the patrol itself, so that you can get a flavour of what the patrols are actually like. 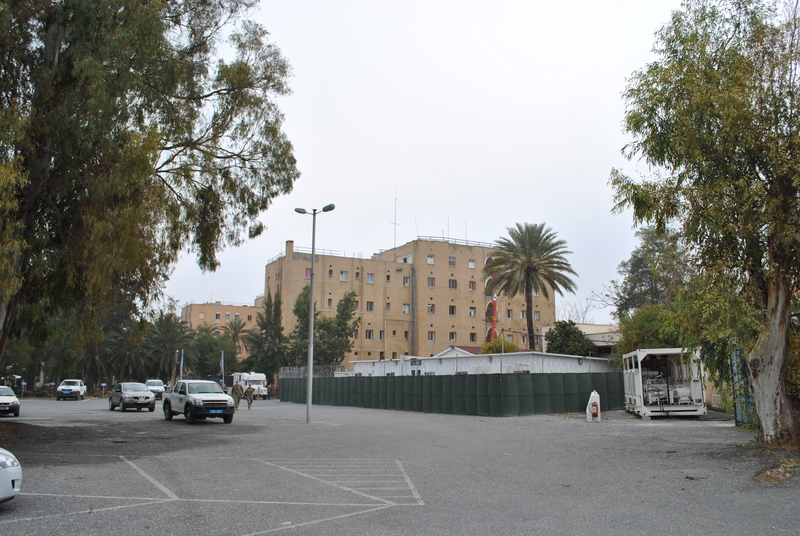 We set off from our base at the old Ledra Palace Hotel, in the centre of Nicosia; our objective was to patrol the western end of our operational area. To get there however first involves a drive through the city. We leave by our main gate and join the busy traffic at the well-known “Billy the Bomber” roundabout. So called because in the centre is a statue of an EOKA member throwing a grenade. A constant reminder of previous troubled times and the British Army’s long standing presence here. We drive through the city towards the old airport, the Cypriots do no give us a second thought we are part of their everyday lives and the sight of the white Toyota Hilux pick-ups we use with the large black UN letters on the side is an everyday occurrence. After a few minutes we arrive at the main entrance of the United Nations Protected Area, as the old international airport is now known. Here we pass through a UN manned check point and receive a salute from the Argentinian soldier manning the gate, immediately we turn off the main road and on to the patrol track. We have entered the Buffer Zone and the change is immediate. We have gone from a modern busy European city to a deserted landscape. 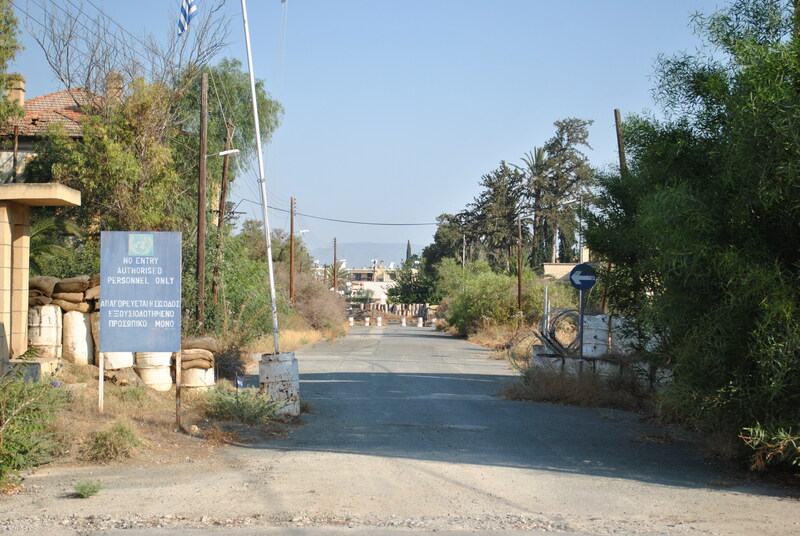 Around us are a few scattered damaged buildings and old defensive positions from the 1974 fighting, as we drive on we see our first Greek Cypriot National Guard Observation posts and Turkish Forces Observation posts. Some are manned but many are not due to the progress that the UN has made in de-escalating tensions between the two opposing sides. We wave at the soldiers and sometimes get a friendly wave back, sometimes though they are indifferent and continue watching us watching them. Our first stop is AD crossing, this is one of three places in Sector Two where the two communities can cross the Buffer Zone that divides them. It also marks the boundary between our West Troop and our Centre troop. Just before we get there however the patrol track takes us past one of the most unexpected parts of the Buffer Zone, when we drive past what are now the back gardens of a row of houses where people still live. The edge of the Buffer Zone is the edge of their property and the patrol track used to be a normal residential road. On the other side of the track are derelict houses. This means the Cypriots living in the houses can just walk out of their property and straight into the buffer zone. Today though nobody is about and it is all quite. Our next stop is an old UN patrol house. In the past up to a company of men were based here and the area was once a problem area. On top of the patrol house is a UN observation point and soon we are watching the Turkish and Greek Forces watching each other and us. Nearby is the Commonwealth War Graves Commission Cemetery of Wayne’s Keep that is located in the Buffer Zone. The cemetery is one of the unexpected jobs that we in Sector Two have, for we conduct visits to it on behalf of the CWGC. Nearby is also an old school, high on a hill that commands the whole area and which has a Turkish Observation point on it, we look to see that all the opposing forces have the right number of troops in their observation posts and they do, so it is time to move on. We set off again driving west and the Buffer Zone opens up here the land is dry and parched. The ground is stony with only the hardiest of plants growing, it is deserted and the Turkish and Greek Observation posts are now in the distance. We continue our drive west to visit a pig farm that has been given permission to operate in the Buffer Zone. We need to monitor the activities of the farmer to see that he is sticking to what has been agreed. This includes inspecting his pig slurry lagoons. The smell is unbelievable and it is not a pleasant task. The patrol is also on the lookout for fly tipping, this has been an issue for many years as Cyprus like most countries charge for commercial rubbish disposal and therefore dumping rubbish in the UN controlled Buffer Zone is a cheap, if illegal solution. Near the pig farm some fly tipping is spotted and so we stop and take pictures. In due course the Municipality will be informed and they will remove the rubbish. 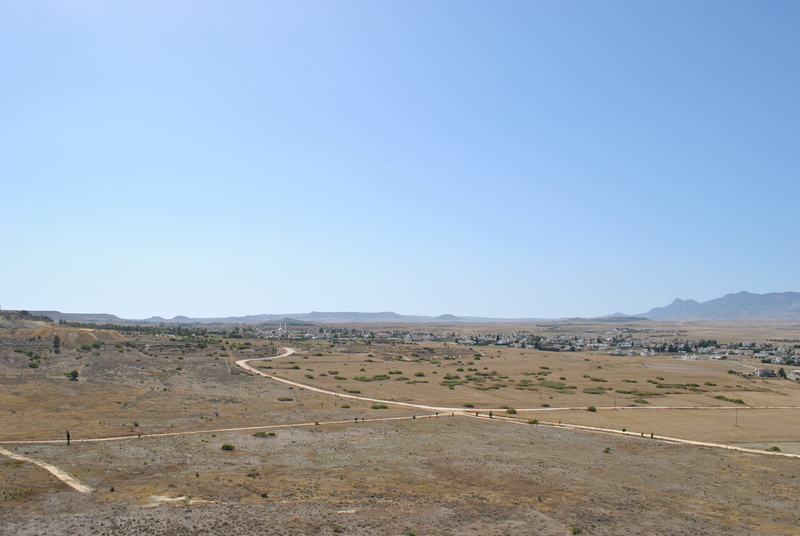 Our final stop of the patrol is at another UN observation post that is in the far west of our patrol area; here the OP is on the edge of a long ridge that means we look out far to the west and north of the Turkish Cypriot area. The land is dry grassland with a strong hot wind blowing. Nothing is moving and in this part of the Buffer Zone we are quite alone. It is only in the distance that the nearest town with its large mosque with twin minarets and a silver dome glistens in the sun. Our patrol has reached the edge of the area of operations and now it is time to head back to Nicosia, another patrol complete.